At 2.57mm thick, LG’s new OLED W7 television might be the thinnest giant television ever made. I don’t want to say that. It feels like hyperbole, and over the next few days I have no doubt that a lot of other televisions are going to use similar tech for similar results, but look at that image above. 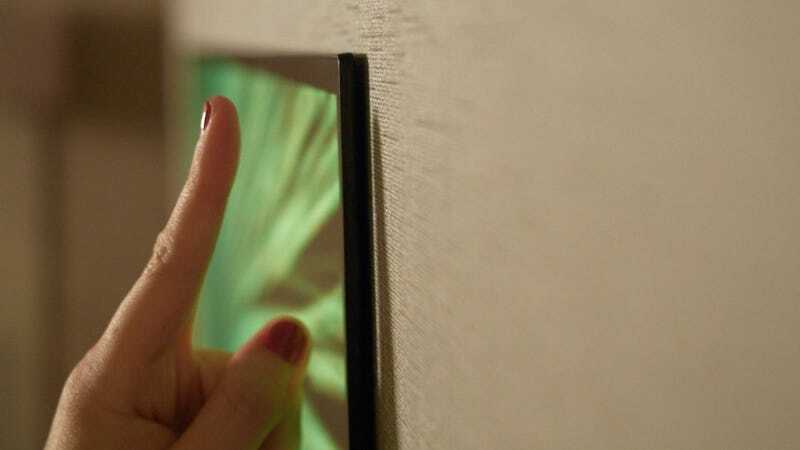 Note how that 65-inch display is actually thinner than that woman’s finger. Now come back and tell me that isn’t incredible. The entire television sits so close to the wall that at first you assume it’s an optical illusion—maybe a fake wall built to hide all the wires and TV guts. Then you pry it away and peer behind it. It really is that thin. The 65-inch version weighs less than 16 pounds and hangs on the wall via a light steel frame, with magnets available so you can force it even flusher to the wall. The guts, and everything from the power cord to the input ports, have all been moved off of the display. This isn’t a new concept. Samsung announced something similar last night. But Samsung’s box of TV guts and ports seems intended to be shuffled off to the side, while LG’s is meant to be front and center as it doubles as a Dolby Atmos soundbar as well. Visually, LG’s new OLED is about as stunning as last year’s model. Colors pop and blacks are true. LG says that it should be capable of reproducing 99 percent of the DCI color space, versus the 97 percent of last year, which means, it will be unnoticeable to you unless you’re a graphic artist or editor and ruminate on color 24/7. The OLED W7 will also support four of the currently competing HDR formats: HDR 10, Dolby Vision, Hybrid Log Gamma, and a new Technicolor HDR format. That makes it one of the better futureproof TVs available right now. And it will need to be futureproof. While LG made no mention of price, last year’s stunning flagship 65-inch G6 cost $8000. It’s a safe bet to say the 65-inch W7 will be lucky to start at the same price when it begins shipping in March. A 77-inch version will also be available, but at a date later this year.